NEW YORK--(BUSINESS WIRE)--letgo, the fastest growing mobile marketplace to buy and sell locally, was named one of the “Best Apps of 2016” by Google this month. letgo, which is free to use, was among Google’s selections in both the U.S. and Turkey, where it is one of the top apps. It was the only app of its kind named to the list. The recognition marks an extraordinary 2016 for the company. Over the past year, letgo has quickly become popular in the U.S., Canada and parts of Europe. 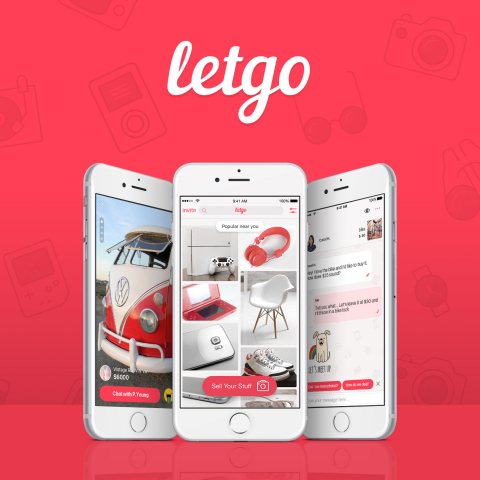 Last summer, letgo announced that its marketplace had passed 30M downloads and 13.2M active users in its first year. letgo also disclosed it was on pace to top $13.2B in gross merchandise value in the U.S. by the end of its second year of operation, far outpacing competitors. The company has raised over $200M in funding from top investors since it launched in 2015.
letgo is the only app of its kind that uses proprietary artificial intelligence and image recognition to auto-title and categorize a seller’s listing. The app also makes it simple for users to browse items for sale nearby and chat instantly with other buyers and sellers nearby. letgo’s free app is the fastest growing mobile marketplace to buy and sell locally. With over 30M downloads to date, letgo makes it easier than ever for users to sell what they don’t need and find great deals nearby on what they do. Users can post an item for sale in just seconds simply by taking a photo because letgo is the only app of its kind with proprietary artificial intelligence and image recognition that automatically title and categorize a seller’s listing. Users can also browse items for sale nearby and chat instantly in the app. letgo was founded in 2015 by Alec Oxenford and Jordi Castello, with co-founder Enrique Linares joining soon after. Oxenford previously founded OLX, which is installed on hundreds of millions of devices worldwide. letgo was named one of 2016’s “Hottest Startups” by WIRED and one of the year’s “best apps” by Google. Its investors include Naspers, Accel Partners, Insight Venture Partners, New Enterprise Associates, 14W and others. letgo has offices in New York City and Barcelona. For more information, visit www.letgo.com and download the letgo app for Android and iOS devices.